Baryonyx was a carnivore (meat-eater) that lived in the early Cretaceous period, about 125 million years ago, in England, Spain, and probably elsewhere in Europe too. It was about 20 feet (6.1 meters) long and probably weighed over 2 tons. Baryonyx is known to have eaten fish as a fossilized meal containing fish remains was found in its stomach - and was for a long time the only known fish-eating dinosaur (scientists now believe that Spinosaurus mostly ate fish too). It has a very narrow skull, with many small pointed teeth, many more than its relatives, the other Theropod dinosaurs: Baryonyx's teeth included 64 teeth in the lower jaw ("mandible") and 32 larger teeth in the upper jaw ("maxilla"). Additionally, the upper jaw contained a sharp angle near the snout that help to prevent prey from escaping (a similar feature is founded in crocodiles for this purpose). It did not have a flexible neck like other Theropod dinosaurs. Furthermore, Baryonyx's head was set an acute angle to the neck, rather than the 90 degree angle found in other dinosaurs. A huge curved claw, about 1 foot (30 centimeters) long, was found with the fossil Baryonyx. It is not certain if this claw was attached to the front or rear feet. It is possible that Baryonyx used this claw to hook fish out of water, while hunting on riverbanks. In any case, Baryonyx was named for this claw, Baryonyx means "heavy claw". The first example was discovered by amateur fossil-hunter, William Walker, who, in 1983, came across an enormous claw sticking out of the side of a clay pit near Dorking, Surrey in England. About 70% of the skeleton, including the skull, as well as the fossilized remains of its last meal inside the rib cage (which is how we know it ate fish), was recovered from this find, and this provided a lot of detail to researchers. (This particular specimen is now located in the Natural History Museum in London, England). Subsequently, further Baryonyx fossils were found in Spain. These principally consisted of a partial skull and some fossil tracks. 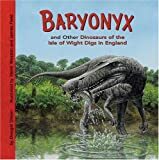 European Dinosaurs - Baryonyx lived in Europe (fossils have been found in England and Spain). Baryonyx was a genus of dinosaur. "Baryonyx" means "heavy claw" (because of the animal's large claw). Baryonyx was a member of the Saurischia ("lizard-hipped") order of dinosaurs. What this means, is that although Baryonyx was not closely related to lizards, it did have similarly shaped pelvic bones. Baryonyx was a Theropod - a member of a group of related bipedal dinosaurs that included the ancestors of birds (although Baryonyx was not itself an ancestor of birds). Baryonyx lived about 125 million years ago, during the Cretaceous period. Baryonyx lived in Europe (fossils have been found in England and Spain). Baryonyx was a carnivore (meat-eater). Baryonyx's diet is known to have included fish, as fossilized fish remains have been found in its stomach. Baryonyx was about 2¼ feet (0.7 meters) in length - although this may be the juvenile size. Baryonyx weighed about 4½ pounds (2 kilograms) - although this may be the juvenile weight. Readers will learn about various dinosaurs that lived long ago and the nature of their environment, including what they ate, how large they were, how fast they were, and much more. Explore the unique world of dinosaurs in coastal habitats. Spread-by-spread match-ups pit different dinosaur species against one another in battles that are scientifically accurate. Fact files give report writers all the info they need at a glance. Presents facts and speculations about the physical characteristics and behavior of this fish-eating dinosaur. - Leveling and Making Dinos Stronger. So, what are you waiting for? Once you grab a copy of our guide, you'll be dominating the game in no time at all! Get your Pro tips now.? Get ready for thrilling action and adventure with Jurassic World! 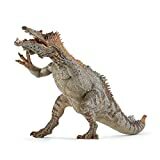 Roarivores dinosaur action figures are inspired by the movie and feature push button sound activation and signature attack moves iconic to their respective species. Play out movie action scenes with signature attack moves like chomping, biting and head butting. Figures also include articulated arms and legs, realistic sculpting and authentic decoration. Choose from Roarivores Triceratops, Roarivores Baryonyx, Roarivores Metriacanthosaurus and Roarivores Allosaurus. Each sold separately, subject to availability. Colors and decorations may vary. Are you the ultimate dinosaur expert? Download the Jurassic World Facts app to bring your Mattel Jurassic World dinosaur figures to life and learn fun facts! Get ready for thrilling action and adventure with Jurassic World! These Action Attack dinosaur figures capture the ultimate movie action with their unique action-attack features! Add realistic sculpting and authentic decoration, and these Action Attack dinosaurs come to life ready for dinosaur action! Choose from Action Attack Carnotaurus (press button to make the head strike forward and jaws chomp) and Action Attack Stegosaurus (press a spine plate to trigger the tail swipe). Each sold separately, subject to availability. Colors and decorations may vary. FUN FACTS: Baryonyx had powerful limbs and could walk on either two feet or all four. The genus name, Baryonyx, means "heavy claw" and alludes to the animal's very large claw on the first finger. PRODUCT SPECS: CollectA's Baryonyx measures 7.5" L x 3"H and is realistic and lifelike from its curved claws to its long crocodile-like snout. CollectA's detailed replica of the Baryonyx is lifelike down to the wrinkles in its scaly hide and the teeth in its long snout. The Baryonyx had long, crocodile-like jaws with 96 teeth, showing that it preyed on fish. This carnivorous dinosaur was first uncovered in England, in 1983 and fossils have also been found in Spain and Portgugal. Baryonyx lived approximately 130 - 125 million years ago. Fossil evidence shows the Baryonyx had long, crocodile-like jaws with 96 teeth, showing it preyed on fish. Remains of fish were discovered in the body cavity of one specimen. 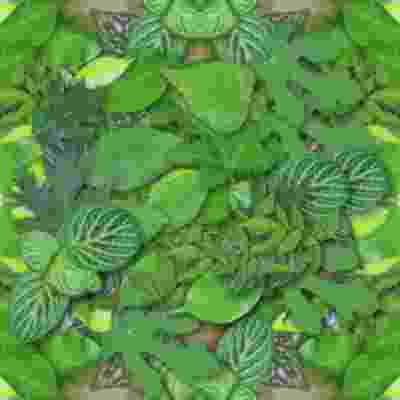 The creature had large, curved claws on its front legs. The Baryonyx grew to be approximately 31 feet long and 9 feet tall. This beautifully sculpted, collectible figure from our Prehistoric Life Collection measures 7.5''L x 3''H. Each prehistoric figure in our collection has been approved by archeologist Anthony Beeson, a well-respected expert in paleoimagery. All CollectA models are individually hand crafted to the highest standards and made with the finest and safest phthalate-free, lead-free materials. Create a natural world in miniature with high quality toy replicas from CollectA. Our mission is to educate collectors and to provide the greatest opportunity for creative play. Get ready for thrilling action and adventure with Jurassic world! 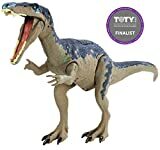 Now you can train your very own realistic, interactive dinosaur with Alpha training blue/gray, based on Velociraptor blue, the fan-favorite character from Jurassic world. Using a remote controller, much like the clicker Owen uses in Jurassic world, you learn how to Train, control and play with your responsive, lifelike Velociraptor. This fully interactive dinosaur has 4 modes of exciting play: training mode, Guard mode, RC mode and total control mode. Training mode teaches you how to control your dinosaur using the accelerometer-based controller that allows blue to mimic movements. Give treats, reward blue by petting her, and move her using responsive motion commands. As you train, you will unlock levels and her behavior improves. Guard mode allows you to set blue in a location and monitor movement. If any “prey” gets within a foot of her motion sensors, The controller will vibrate. You can then issue appropriate commands to warn intruders. Rc mode uses the joystick portion of the controller to move around. Like a vehicle, you can control blue to move forward, backward and side to side. In total control mode, you control blue’s movements, from her eyes and mouth to her head, you decide how she comes to life. With incredibly lifelike movement, Alpha training blue moves, blinks, roars, chomps and responds to your commands for a truly immersive interactive experience. Play out movie action scenes with signature attack moves like chomping, biting and head butting. Choose from Roarivores Triceratops, Roarivores baryonyx, Roarivores metriacanthosaurus and Roarivores Allosaurus. Get ready for thrilling action and adventure with Jurassic World! These Action Attack dinosaur figures capture the ultimate movie action with their unique action-attack features! Add realistic sculpting and authentic decoration, and these Action Attack dinosaurs come to life ready for dinosaur action! Choose from Action Attack Carnotaurus (press button to make the head strike forward and jaws chomp) and Action Attack Stegosaurus (press a spine plate to trigger the tail swipe). Each sold separately, subject to availability. Colors and decorations may vary. Are you the ultimate dinosaur expert? Download the Jurassic World Facts app to bring your Mattel Jurassic World dinosaur figures to life and learn fun facts! CollectA's replica of the carnivorous Baryonyx is detailed and lifelike, down to the serrated teeth in its long, crocodilian snout. 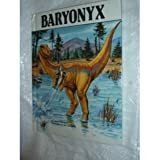 The first specimen of the Baryonyx was found by an amateur fossil hunter, in clay pits south of Dorking, England and other fossils have been found in Spain and in the Republic of Niger. Fossil remains dated to the early Cretaceous period indicate that Baryonyx was a fish-eating dinosaur. Paleontologists estimate that the creature grew to be approximately 31 feet in length. This beautifully sculpted, collectible 1:40 scale replica from our Prehistoric Life Collection measures 10''L x 4''H. Each prehistoric figure in our collection has been approved by archeologist Anthony Beeson, a well-respected expert in paleoimagery. All CollectA models are individually hand crafted to the highest standards and made with the finest and safest phthalate-free, lead-free materials. Create a natural world in miniature with high quality toy replicas from CollectA. Our mission is to educate collectors and to provide the greatest opportunity for creative play.